I saw this a little earlier this morning, scheduled for 19 January. 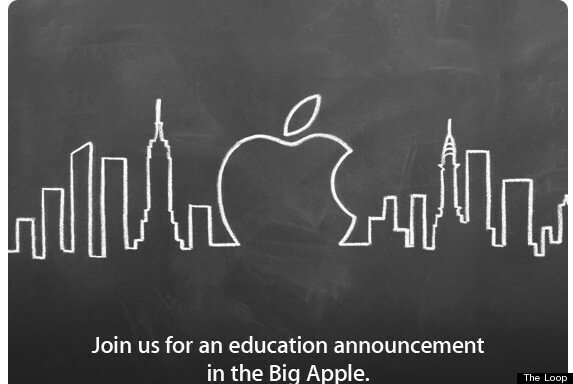 It’s labeled as an “education” event, so I am curious what itmay entail. On the one hand, there’s the faint hope that maybe, since it’s in New York (home of most of the major publishing houses), maybe there will be some announcement of repealed DRM on purchases through iBooks, similar to what iTunes finally moved to with music. I’m not betting on it, mind you, but one can hope. It might make me more inclined to get more through iBooks. However, even if it’s only – exclusively – an announcement related to textbooks, I think that would still be a huge plus, depending on how the features play out (not sure how the “highlighting” might play out, and it’s hard to put sticky notes for easy study reference [yes, I know about bookmarking, but when you’re trying to study for an exam across multiple books, I can see there being some issues])… just the size alone of some of the books is crazy, and that’s just college, not to mention the bulk that are textbooks in middle and high schools. Dropping an e-file on an iPad would remove the half-metric ton that’s crammed into lockers and carried on backs by our nations 12-year olds. So, on this particular night, our regular hostess and question asker was on her last night (she was only going to be working the Sunday night sessions, which we hadn’t usually been attending). She had with her on this night, a “new guy” who was in training to take over the week night sessions from her. He spent most of the night observing, and working the spreadsheet to tally scores, but at one point she handed him the microphone to ask one of the questions. That was the only question he asked that night. MC and I took a little hiatus from trivia after that night, and we were told later that there was someone different the following week. That guy’s not been seen since. And for the record, Sammy’s the oldest. Which I guessed simply because I knew he had already been a solo recording artist by the time Van Halen’s first album hit the scene.